Today’s Daily Prompt challenges us to write about something we’d like to un-invent: If you could un-invent something, what would it be? Discuss why, potential repercussions, or a possible alternative. This is my opening to bring up a subject that will probably become a series of posts about how we can enhance our mental health using nutrition and other alternatives to psychotropic drugs. The subject of psychiatry, in fact, is so insidious that my personal challenge today will be to stick just to the topic at hand. Psychiatry is a deep cesspool in which one can get easily drawn down, down, down. So what do I think should be un-invented? The DSM! This stands for Diagnostic and Statistical Manual and it is an invention in the most literal sense of the word. 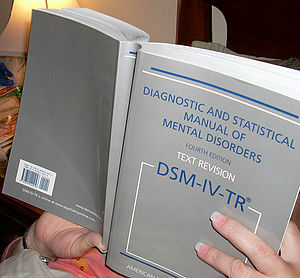 Currently volume four, known as DSM-IV, is the psychiatric “billing bible” filled with 374 so-called mental disorders which one can be “diagnosed” with and then billed for. That’s right! They raise their hands and vote on this stuff at their conventions and meetings. Did you think the field of psychiatry was based on medical science? And so we have 20,000,000 children in the world being diagnosed with mental illness and their parents being told they have one or more of these so-called “disorders.” Many are told their children have “learning disorders” caused by “chemical brain imbalance.” NONE of the parents are shown any test results because no tests are done. There are no tests. Just your sneering smiling psych and his minions, drooling over the money they will receive for putting the children on drugs that only have a long list of horrific side effects including suicidal and homicidal ideation. And speaking of horror, the new version of the DSM–the DSM-V–is just around the corner about to be published. According to the dear APA, we have unfortunately developed dozens and dozens of new “disorders” which they will gladly fix for us. So many more of life’s every problem will now be a mental illness that can be drugged and billed for. It all sounds very “scientific” in the DSM but there’s not a shred of science in it. The DSM is the biggest, most fraudulent piece of junk-science and pseudo-medicine known to man. And here’s a link to my friend Chill E B’s music video to help you understand. Opens the door to real solutions for people’s problems instead of masking them with mind-altering drugs and never resolving the actual problem. Fewer school-shootings, mass homicide/suicides and bizarre killings. Drastic reduction in zombie-like children and adults. Fewer kids addicted to drugs by being put on psychiatric “medicine” that is a Class 2 narcotic in the same category as cocaine. Billions of government dollars used for something constructive instead of something destructive.